Bring the entire family to celebrate the beauty and pageantry of the holidays with Ballet Etudes' annual production of the beloved ballet, The Nutcracker, at Huntington Beach High School Auditorium. 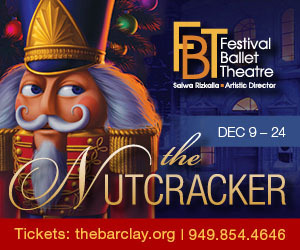 Set to the timeless music of Peter Tchaikovsky, The Nutcracker tells the story of Clara, a shy young girl who receives the gift of a nutcracker soldier from her mysterious godfather. During the night, magical events unfold: the Christmas tree grows taller, toy soldiers and little mice become larger, and Clara's nutcracker comes to life. 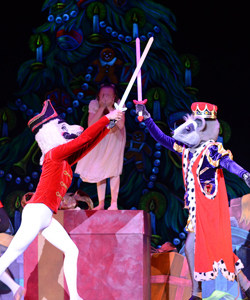 He battles the ferocious Mouse King, and just when it seems all is lost, Clara distracts the Mouse King and saves her beloved nutcracker. This enchanting, child-friendly, 90-minute traditional production is choreographed and directed by Ballet Etudes' Artistic Directors Megan Pulfer and Sean Crawford, and Assistant Artistic Director Sasha Robertson. The cast includes over 100 children from Huntington Beach and surrounding cities. Ballet Etudes is Huntington Academy of Dance's resident non-profit youth ballet company whose mission is to expose a new generation of children, both performers and audience members, to the beauty, grace, and athleticism of ballet, and to offer this experience at affordable prices.